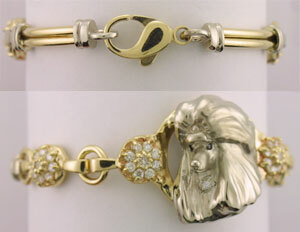 All of these bracelet designs are extremely well made, comfortable, and have substantial weight to them. All of the links are soldered. 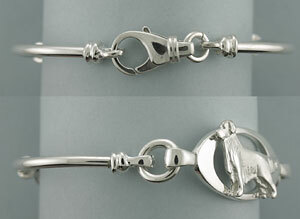 We have designed and casted our own joining links where we have “beefed” up all the wear points. 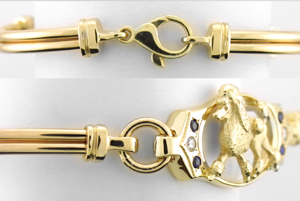 We finish off the bracelet with (in our opinion) the most reliable clasp – the lobster clasp. 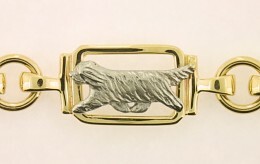 These are truly beautiful, lasting pieces of art to wear on the wrist. 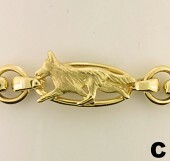 This is our 6 link small circle bracelet style. We can design this with small or tiny head, standing, or running studies. 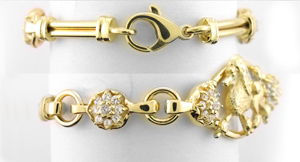 This is our 5 link medium circle bracelet style. We use medium head, standing, or running studies for this style. 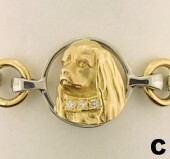 Here is our small 6 link oval style. This is suitable for tiny breed studies. 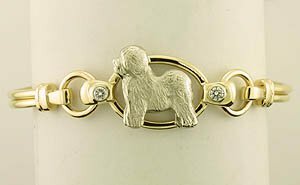 This is our medium oval link bracelet which will accommodate most small and medium breed studies Of course, diamond or gemstone collars will cost more. 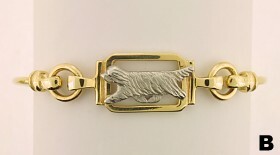 This is a larger medium oval 4 link bracelet. 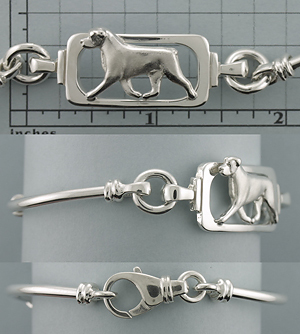 We usually make this with small or medium breed studies. 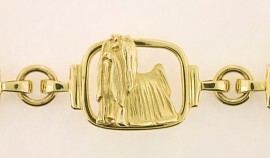 This is the medium rounded rectangle 5 link bracelet. 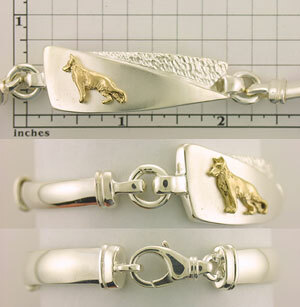 We usually make this with small or medium breed studies. This is the 5 link medium rectangle style. This style tends to be a little more heavier than the other styles and accommodates small breed studies. 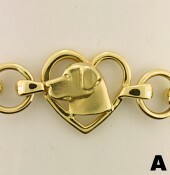 This is the 4 link medium rectangle style with diamonds on the sides of each link. This style tends to be a little more heavier than the other styles and accommodates small breed studies. 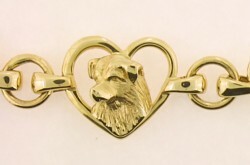 This is the 5 link small rectangle style. This style tends to be a little more heavier than the other styles. 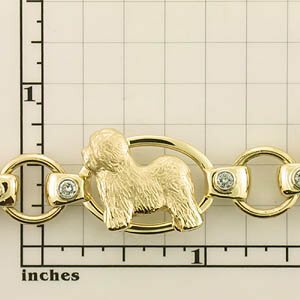 It accommodates tiny and small breed studies. 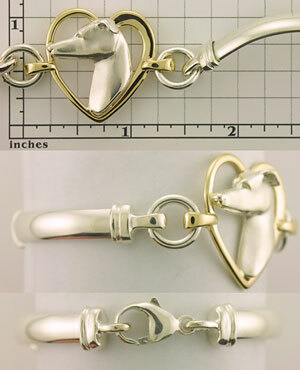 This is the 6 link tiny heart style. 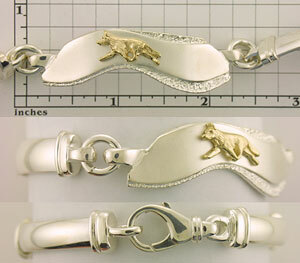 The following bracelets are what we call the “soft bangle.” We make these in five weights, and all are very sturdy. The difference between the weights is the wire we use to make up the shoulders (the side pieces). SL (Single Light), SH(Single Heavy), DL (Double Light), DH (Double Heavy), DHH (Double-Heavy Heavy) and TH (Triple Heavy) all describe the shoulder wire. This wire is made special to have “spring tension” for added strength & durability. 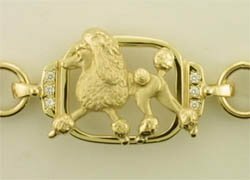 We also cast our own joining links and beef-up all of the wear pints, and finish off with (in our opinion) the most reliable clasp – the lobster clasp. 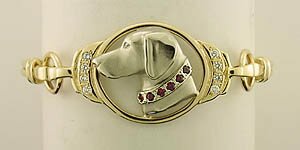 This is the single light (SL) shouldered soft bangle - this works well with tiny and small breed studies on the small circle, oval, rectangle, or heart center link. 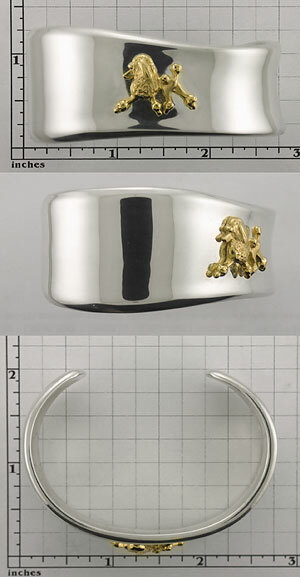 Here is the single heavy (SH) shouldered soft bangle. 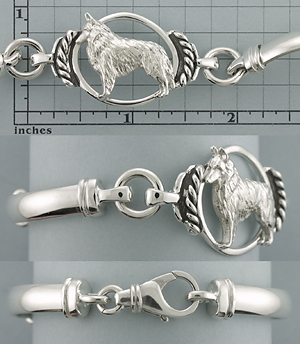 This looks good with smaller breed studies and any style of small and medium centerpiece links. 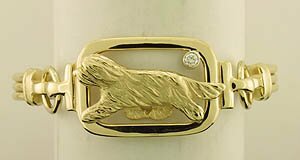 The double light (DL) shouldered soft bangle (shown in two tone and all yellow gold) looks great with small to medium breed studies and any style of centerpiece links. 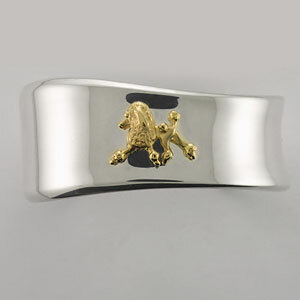 This is the double heavy (DH) shoulder soft bangle. 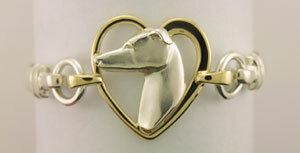 We use this for most small or medium breed studies on any centerpiece link. 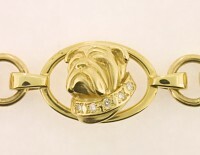 We also prefer to use this weight of bracelet for our diamond or gemstone collar and diamond or gemstone accent pieces. 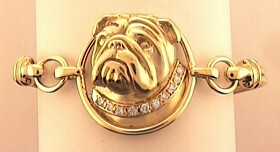 This is the double-heavy heavy (DHH) shoulder soft bangle. 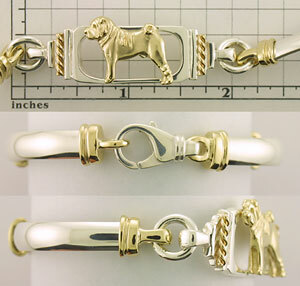 We use this for most large breed studies on any centerpiece links. 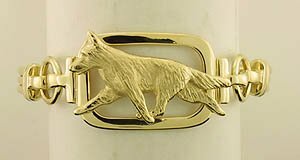 This also makes a nice foundation for a gents bracelet. This is the triple heavy (TH) shoulder soft bangle. 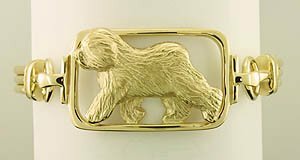 We use this for most large breed studies on any centerpiece links. 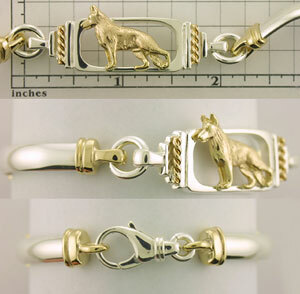 This also makes a nice foundation for a gents bracelet.